Brain tumours are not like leukaemia in terms of research. Every day I look at Pippa in wonder and amazement but I will never be complacent. She truly defies logic. I hope that one day whatever it is that makes up her incredible being contributes to brain tumour research. Today has been a cancer research themed day. On Australia Day Pippa was the VIP guest at a fundraising event in Warrnambool. This understated little event called Kick-It Down Under was held in aid of the Royal Children’s Hospital Cancer Research. The second time it has been held in Warrnambool (the only times outside the USA), it is part of the Jeff Gordon Children’s Foundation raising much needed research money across the United States for Paediatric Cancer. The game (Kick Ball) is similar to baseball but with a large rubber ball that is kicked. I had to do a bit of googling to work it out but my children tell me in Australia they call it “Boot Ball” and play it at school and with friends in the street. The participants of the game were the Australian and USA Sprint Car drivers who were in Warrnambool for the Australia Day Long weekend Classic. This is about where my knowledge of all things sprint cars starts and ends, but I think that this particular meet may be the biggest (should I say in the world? I don’t know, the Southern Hemisphere perhaps sounds pretty safe). Pippa started the game off with a “pitch” and then also kicked and ran for both teams. A fun experience! Today was the cheque presentation to the hospital. Later this afternoon we also went to meet the family who have started Robert Connor Dawes Fund. In memory of their son, brother and friend, this group are campaigning for more brain cancer research. They are also the inspiration, motivation and support behind Pippa’s yoga and music therapy through her radiation and now her continued yoga therapy in Melbourne. It was a little bit confronting for me and I was quite apprehensive. Liz has been on the other end of a text message for me and I felt I wanted to meet her. I’m glad I did but I am particularly glad that they were abe to meet Pippa. I applaud them for all they are doing and for speaking up loud for brain cancer research and hope that by meeting Pippa their fight will be inspired further. After the last chemo cycle we decided to pack up the car and take a little driving holiday visiting lots of wonderful friends. A blood test on the Monday morning to check all was OK and we were on our way. Also coming along with us was the recent heatwave! We started by taking the ferry from Queenscliff to Sorrento, then went across the peninsular to Ballnaring, up to the Yarra Valley, across to Seymour and then back down to Melbourne and home. Our next visit will be no exception. 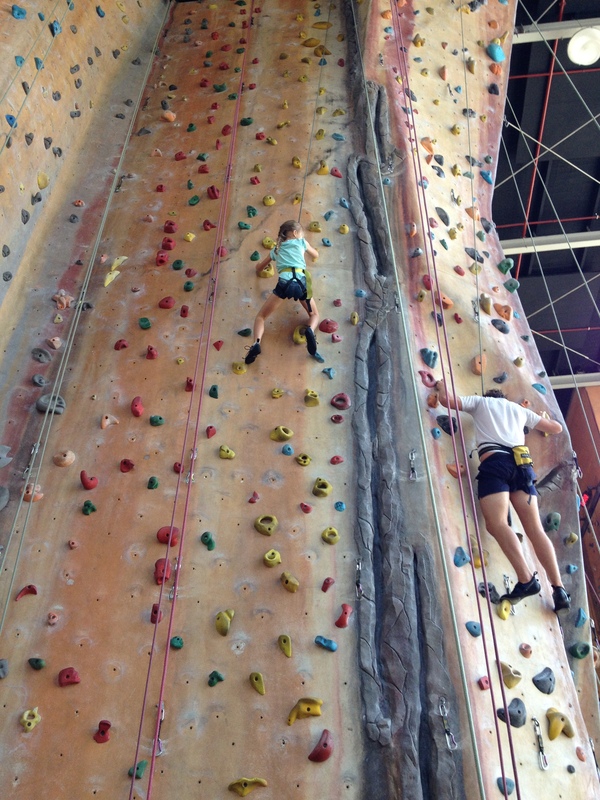 Pippa has listed her favourite things she did on our holiday……..
She scaled 18 metres with ease. Her brothers were considerably impressed but I was not surprised at all to look around the room and only see one pint sized rock climber 3 storeys high! 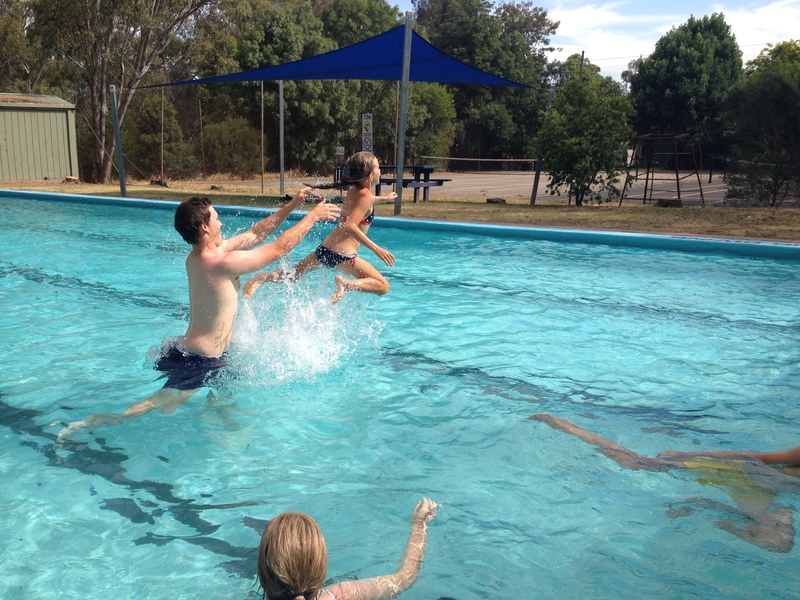 Pippa has no fear and will always give anything a go (and is usually pretty good at it too!). Pippa’s 12 month chemo cycle is supposed to be 5 days on, 3 weeks off starting every 4th Monday. The late drop of bloods in the 4th week of the cycle however has meant that this has not been the case and with each cycle we have had to wait until Pippa’s blood test results are at a level where it is safe for her to receive chemotherapy. The outcome of this though is that it has made her behind on her 12 month, 4 weekly cycle and thus, this is why her doctor is adjusting her doses to try and enable the chemo to be taken monthly. This of course is all written in sand anyway and lead by Pippa in how she responds and copes with the chemo and results of current and future MRIs. Thus, we are zig-zagging along learning as we go with not really any guide book to show us the way. But that’s OK we seem to be managing quite well. The first day of Pippa’s last cycle was the second last day of 2013. After that night I was definitely not looking forward to any form of New Year celebration at all. I gave Pippa the 2 (new levels of) doses of chemo and within 1-2 hours she was in all sorts of pain and discomfort along with awful waves of nausea. Needless to say, Taylor Swift and heat packs were called upon. Her body was aching and he tummy was twisting in knots. I could see the hurt in her eyes. She was exhausted from the day anyway so curled up in a ball while Taylor Swift sang her to sleep but she tossed and turned all night. The next day I decided that I would have to resort to using the really strong painkillers I have in case the side affects of chemo become unbearable. Pippa is so strong; she didn’t want them on the first night but I couldn’t watch her writhing like that again. We had stayed in Melbourne due to our long day at the hospital and driving back I thought like I always do. (A lot of thinking is done in the car while Pippa sleeps. ) I hadn’t been expecting the pain to be so extreme the first night and wondered what I could do to help. I decided to put in place a routine for the next night. I knew that once we need to use the painkillers we have reached a threshold so to speak and there is no margin for adjustment in treatment if her doctor needs to do so. Day 2 of the cycle and at 4.45 I gave Pippa her first dose of chemo, at 5.15, her second, at 5.45 we ate a healthy dinner of protein and vegetables. After dinner she had a deep, warm bath. Pippa then stepped out of the bath and onto a massage table for a 45minute massage and then into bed. This meticulous routine was followed for the remainder of the chemo that week and Pippa did not have even a hint of pain. Most mornings she woke with a sore belly, but that has been normal and even continues for a few days after she finishes the chemo. That pain is easily fixed with a heat pack. Having been able to cope with the different dose of chemo in this way means we are not at our maximum and if we need to get more aggressive the room is there to do so. The pain killers are still up my sleeve, I’m not afraid to use them but I am fully aware of what I am dealing with. Pippa is taking it in her stride and by me changing the way I help her do that we are still well and truly on the front foot. Hopefully we can manage the next cycle in the same way.